At times, since 2000, interest has piqued in Sino-Japanese competition—over Russia (rival proposals for an oil pipeline in the early 2000s), South Korea (maneuvering within ASEAN+3 and in the Six-Party Talks), and India (recently, as Abe Shinzo and Xi Jinping both are seeking upgraded ties to Narendra Modi)—, but the most intense, sustained rivalry has unfolded over Southeast Asia. In 2013-2014, under the shadow of much more serious bilateral tensions, Abe and Xi have turned to Southeast Asia as the venue where they can fend off each other’s advances and pursue their state’s national interests and national identity objectives most productively. Each keeps firmly in mind the role of the United States as a third outside power in this region, while weighing strategic, economic, and civilizational aspects of relations with the various states of Southeast Asia and with ASEAN as its representative organization. Indeed, ASEAN+6, inclusive of India and Australia with ASEAN at the core, is the broader arena, rather than Northeast Asia, for the intensifying competition in 2014. Japan’s priority for Southeast Asia—often second only to its US alliance—dates back to the 1950s, if we set aside the prior importance of the region in Japan’s decision to attack Pearl Harbor and launch the Pacific War as part of World War II. The Yoshida Doctrine, which was institutionalized as the predominant postwar strategy with the 1955 merger of the Liberal-Democratic Party as the ruling government, emphasized three means to realize recovery from Japan’s defeat in 1945: economics rather than security or values as the policy focus; the United States as the indispensable partner at the price of an independent foreign policy; and maintenance of the Constitution as the guiding light for keeping peace with progressives at home and reassuring states abroad that Japan accepted the verdicts of the victorious, US-led coalition of powers. Yet, in 1957, an alternative doctrine advanced by Prime Minister Kishi Nobusuke, the grandfather of Abe and a war criminal, began its parallel, if less obtrusive, existence in LDP leadership circles. It was not satisfied with leaving economics alone as the driving force in Japanese foreign policy, with no autonomous foreign policy from the United States, and with sticking with the Occupation-approved Constitution at the cost of pride in Japan’s past and rebuilding armed forces capable of defending Japan. A major thrust of Kishi’s policy was Asianism centered in Southeast Asia, which was seen as compatible with the economic priority in the Yoshida Doctrine and with the US relationship, since Kishi staked his leadership on forging a Security Treaty with the United States while backing its growing security role in Southeast Asia. Yet, his objectives in the region went well beyond those of the United States, laying a basis for prioritizing Southeast Asia over the past half century and for Abe’s recent moves. Japan’s normalization of relations with the Soviet Union in 1956 was overshadowed by the deepening territorial dispute and the Cold War, its normalization with South Korea in 1965 resulted in scant diplomatic cooperation because the “history issue” was not resolved, and its normalization with China in 1972 gained little momentum until the end of the decade when Deng Xiaoping abruptly redirected China’s course. Southeast Asia beckoned as an ever-growing opportunity. Newly freed from the rule of colonial powers and threatened by revolutionary movements supported by China, as well as the possibility of a “domino effect” from the North Vietnamese push to reunite with South Vietnam in a war that extended to Laos and Cambodia, states in Southeast Asia found Japan an appealing partner as the United States was losing the Vietnam War and Japan’s economy was poised to forge production networks by embracing the “flying geese model” of a region advancing together in formation. As most eyes focused on great power relations and Northeast Asia, Japan was looking more attentively at Southeast Asia as the ideal setting for its anticipated leadership prowess—massive development assistance, export of a superior modernization model, cultural leadership drawing on popular and traditional genres without the overtone of Western values, and, finally, regional political leadership in a new era. As China pulled back from its revolutionary fervor, eclipsed by the Soviet Union in Vietnam and then marginalized in Cambodia by Vietnam’s invasion, and the United States licked its wounds after the defeat in Vietnam, Japan filled the vacuum with the Fukuda Doctrine, articulated in an August 1977 speech by Prime Minister Fukuda Takeo. This was much more than a rising economic power casting a broad web to secure natural resources, new markets, and, increasingly, lower-cost suppliers for its industrial leviathan. Calling for “heart-to-heart” relations, Fukuda put Japan’s full weight behind ASEAN and the strengthening of regional institutions, pledged that Japan would never become a military power (unlike the other great powers active in the region), and launched assistance programs aimed at nation-building without the same insistence on values associated with US development assistance or the image of a hierarchical order into which states of the region would fit. Soon, China’s reform program appeared to enmesh it into the same range of production networks, while its low-key foreign policy of the 1980s (with many states in Southeast Asia hesitant still to normalize relations with it) appeared to leave a triumphant Japan poised to spread its values (dismissal of the relevance of pre-1945 history and acceptance of “Asian values” centered on Japan’s differences with the United States) to the region. Japan’s principal foreign policy success in the Cold War era was not the alliance with the United States (over which Japanese leaders were chafing by the late 1980s due to a sense that their country could not say “no” or was unable to become a “normal” country), but the respect and leadership it enjoyed in Southeast Asia, while Chinese power and influence were very limited, even among overseas Chinese communities. Increasingly, in the 1990s, Chinese publications referred disapprovingly of Japan’s foreign policy in Southeast Asia. Coverage of Japan became entangled with China’s search for a great power identity and its calculation that the projection of Japan’s influence came at the expense of China’s power projection.3 Through most of the decade, China opposed efforts to widen ASEAN’s role as opening the door to Japan’s assertion of regional leadership, but in the late 1990s, China changed its attitude. It saw that Japan’s stagnation after the bursting of the “bubble economy” undermined its economic and moral leadership claims. It gained more confidence of its relations with Southeast Asian countries and its growing economic clout, especially after the Asian financial crisis exposed the region’s fragility. Finally, China’s overarching goal of splitting the US-Japanese alliance looked more promising, no longer on the basis of Japan’s hegemonic ambitions in Southeast Asia clashing with US leadership there, but through exclusive Asian multilateralism backed by China weakening the United States in Asia, following the resentments the latter aroused with its handling of the financial crisis. Economic regionalism raised hopes for Sino-Japanese cooperation through ASEAN, but these were fading after just a few years,4 as China pressed its exclusive approach to Asia and Japan sensed that it was too weak to balance China in ASEAN. In the late 1990s and early 2000s, there was much talk of Sino-Japanese relations being a “win-win” relationship, with Southeast Asia widely cited as a prime example. Whether the subject was regionalism under ASEAN’s leadership, security in an era of globalization when piracy and other non-traditional security threats appeared to be the greatest threat in Southeast Asia, national interests before China that designated the South China Sea a “core interest,” the challenges facing the entire region after the Asian financial crisis, multilateralism’s compatibility with rising multipolarity, or even mutual support for the law of the sea, Chinese publications were disinclined to identify problems with Japan.5 Exploration of “new thinking” toward Japan as long as two years into Koizumi Junichiro’s tenure as prime minister was proof that there was no plan, yet, to demonize Japan and make it a pariah in Southeast Asia.6 Despite the sharp downturn in relations in 2004-2005, reflected not only in China’s decision to brand Koizumi unredeemable and sanction massive demonstrations, but also in its futile effort to prevent the formation of the East Asian Summit with three countries seen as friendlier to Japan than to China, another period of accentuating positive ties with Japan followed in 2006-2008. The fact that Abe—a known revisionist—was prime minister in 2006-2007 did not interfere with relations “thawing” and then growing warmer. In Southeast Asia, the tense atmosphere over the EAS appeared to be past.7 Yet, the tone in Chinese writings about Japan was more critical of its history, foreign policy, and thinking about Asian regionalism. Beneath the surface, as Japanese articles were reluctant to acknowledge, despite considerable coverage of strains in bilateral ties, the foundation of the relationship was being undermined by Chinese rethinking. A joint Sino-Japanese project in 2001-2003 captured the high point in the pursuit of regionalism centered on Southeast Asia. The editors gave the impression that if only the media in both countries were less one-sided in reporting on bilateral relations and focused more on the promise of regionalism instead of sensationalism about issues that arise, momentum would be building. As is often the case, the volume has much less on the Chinese media and how China was acting in a manner that failed to reassure Japan, while finding false hope in the few articles of 2003 advocating “new thinking” toward Japan and pointing to the scarcity of articles in Japan on East Asian identity. The impression is left by Amako Satoshi that Japan for no good reason is putting the most barriers in cooperation with China in Southeast Asia: delaying in signing the TAC with ASEAN when China had signed, not appreciating China’s new support for multilateralism in the Six-Party Talks, concentrating on building over the long term a middle-income society in a still developing country, and introducing the history issue through Koizumi’s visits to the Yasukuni Shrine.8 His advice to China is only not to look down on Japan, whose economy was still number two. Others are more focused on US responsibility with a “divide and rule” approach to the region, indicating that Japan needs to overcome US opposition, seen in its rejection of the Mahathir proposal for the EAEC (which Chinese authors endorse) and of Japan’s call for an AMF (Asian Monetary Fund) as well as in George W. Bush’s foreign policy. In 2009, Chinese writings on Southeast Asia shifted significantly. No longer was the emphasis on ASEAN centrality as effective in managing great power differences, the ASEAN Way as ideal for dealing with cultural differences, and economics foremost in regionalism. Japan’s policies toward Southeast Asia were peripheral to the narrative at this time, but the decision to press for Chinese leadership in Southeast Asia was to have important ramifications for bilateral relations in this sub-regional context. Japan was cautiously accepting of regionalism despite a loss of enthusiasm after Koizumi’s January 2002 embrace of the East Asian community in Singapore. It kept pursuing regionalism centered on ASEAN, aiming to balance China’s growing weight without losing optimism about the benefits. In the fall of 2009, oblivious to the shift in the Chinese narrative in a hardline direction, the DPJ came to power reaffirming the East Asia community ideal, while alienating the United States on the issue of the transfer of a US base in Okinawa. Even as China was thinking more of a “win-lose” relationship in Southeast Asia, Japan’s tone was more hopeful than in recent years. Reporting on the Shangri-La Dialogue in early June 2014, Yomiuri shimbun focused on how the gathering had addressed China’s one-sided, coercive efforts to change the status quo in the South China Sea.11 It noted that the meeting was filled with harsh criticisms of China’s expansionist behavior, especially the statements by Abe and Hagel to which General Wang Guanzhong responded sharply. Japan displayed strengthened ties to Vietnam and the Philippines. The article further cites Malaysia and Indonesia as taking exception to China’s views amid a general reaction that it is only concerned about great power reactions as it repeats that this sea is its “core interest.” Of the states present, only Russia is cited as backing China’s position. Abe’s scarcely veiled criticisms of China set the tone for the confrontational exchanges. A few days later, Abe was in Brussels making the same case before the G7. Japanese firmly believed that China had rejected Japan’s repeated overtures and enthusiasm for a win-win regional outcome, in favor of a sinocentric order marginalizing Japan. The George W. Bush administration saw Japanese policy in Southeast Asia relatively autonomous from US policy, which was centered on anti-terrorism and two wars in other regions. Japanese-US relations had stabilized after some difficult moments in the 1990s, and the positive image of closeness between Koizumi Junichiro and Bush stood in sharp contrast to the troubled images of many other allied leaders meeting the US leader. Yet, in the active search for regionalism centered on ASEAN, Japanese were testing the intentions of China with Americans on the sidelines. Whether in the pursuit of a vision for the “East Asian Community” or in the quest for financial bonds starting with the Chiang Mai initiative, Japan’s diplomacy with ASEAN increasingly was competing with China’s diplomacy to define the objectives and the limits of an exclusive regional community. Only with the Obama administration’s decision to join the East Asian Summit and become a more active partner with ASEAN in the search for a more inclusive type of regionalism did the alliance role in Southeast Asia become more pronounced. China’s decision to change its approach to ASEAN, soon accompanied by an aggressive approach to “core interests” in the South China Sea, raised the stakes for the alliance in this region, as Japan welcomed Obama’s “rebalancing to Asia” with support also for its wider reach to Australia and India. In 2009-2012, DPJ hesitation and the trauma of the Fukushima disaster left Japan focused inward or more narrowly on China in the East China Sea, but Abe took office just as China was pressing harder in the South China Sea and Obama was responding. The alliance role in Southeast Asia grew markedly in 2013 as Japan focused on the area. In 2014, Sino-US relations were tenser after the get-acquainted Sunnylands summit of Obama and Xi lost its temporary halo, and Sino-Japanese relations continued to be at their nadir. Southeast Asian tensions did not abate, as global tensions deepened. At the June 4-5 Brussels G7, whose focus in line with the agreement among the same states in The Hague at the Nuclear Security Summit was Russia, “another important theme” drew headlines in Japan, i.e., the criticism of China for its coercive advances in the East and South China seas. Noting concern over China’s oil rig near Vietnam and the need to affirm the rule of law on the oceans, one Japanese article observed that the United States and Japan had joined in seeking this statement, leaving vague whether Japan had been looking for a quid pro quo for its agreement to sign onto the sanctions against Russia.12 In the summer of 2014, with China following Russia in more provocative military challenges, Japan could hardly expect US support in one arena without stifling its regrets and giving its backing to the West in the other. The case for close Japan-US-Australian strategic relations in response to China was presented by Terada Takashi in a book edited by Yachi Shotaro not long before he became the chief foreign policy advisor to Abe as Abe returned as prime minister. It showcased the three-way strategic dialogue, shared values versus China, and joint concern about China’s military rise, including in the South China Sea. Yachi called in the introduction for expanding the Japan-US alliance, raising Australia’s salience.13 Strengthened Japanese-Australian ties were visible in mid-2014, as Foreign Minister Bishop endorsed Japan’s maritime position versus China and the new constitutional interpretation in support of collective self-defense, and then Abe in Canberra signed an agreement to jointly develop submarine stealth technology as the two countries find that their interests intersect in Southeast Asian waters. An editorial in Yomiuri shimbun made clear that to contain China’s willful behavior, the Japan-US alliance is linking to ASEAN, the EU and others to broaden the rule of law’s use.14 Commenting on the July Strategic and Economic Dialogue, Asahi shimbun stressed clashing views on maritime issues as well as on cyber security, pointing to growing doubts about China’s intentions and warning that big states should not be bullying smaller states, as is occurring in the South China Sea.15 Meanwhile, Xi used his visit to South Korea to castigate Japan for its militarism as well as its revisionism, despite the refusal of Park Geun-hye to include joint criticism in the official statement. The battle lines were being drawn more clearly throughout East Asia. In early September, Modi’s visit to Japan, upgrading relations with security joining economics in the forefront, and unprecedented plans to export Japanese submarines to Australia showed the breadth of defense linkages even before Modi visited Washington later that month. Various explanations have been offered for Abe Shinzo’s energetic courting of the countries of Southeast Asia since he returned as prime minister. First, one finds the view that this is alliance-boosting, reinforcing the emphasis on US-Japan relations as Washington too is intensifying relations with Southeast Asia as part of its “pivot.” Second, Abe’s overtures can be perceived as a renewal of Asianism, seizing the best opportunity to reinvigorate both an arm of Japanese policy and a theme of national identity that his grandfather Kishi Nobusuke had championed when he was prime minister in 1957. Third, this may be interpreted as a realist move related to Abe’s call for “collective self-defense,” since the South China Sea is on Japan’s vital sea lanes. Finally, many view Japanese enthusiasm for Southeast Asia as either a defensive move to counter China’s “encirclement” of Japan or an offensive push to “contain” China. Of course, multiple explanations are bound to apply. Academic analysis is best pursued not by choosing one cause and illustrating why it matters, but through interpreting debates in Japan in the context of a struggle over where that country is heading. Abe’s leadership has intensified debate over national identity and interests. After the divisive ARF meeting in July 2012, Takeda Isami assessed the situation, warning that ASEAN was in danger of becoming a dead entity, as it was swallowed into Sino-US polarization without agreement on how to reassert ASEAN’s voice.16 The basic principle of ASEAN, he argues, is to use the great powers but not to fall under their influence. Accordingly, it has enhanced its presence as the host of a string of high profile meetings of national leaders. Yet, at the 2012 ARF meeting, the host, pro-China Cambodia, fiercely clashed with anti-China Philippines, doing severe damage on the issue most important to the organization—alarm about China on the South China Sea question. Due to Cambodia’s hardline posture—even turning off the mike when the Philippines representative was speaking, leading to an early departure—, it has become clear that the poor countries in ASEAN are highly vulnerable to Chinese pressure. The share rich-poor divide—Singapore’s GDP per capita being more than 50 times that of Cambodia—does not bode well for cohesion, on display in the host city of Phnom Penh, where even the meeting hall was built by the Chinese. Whereas a decade ago, English was indispensable for the business elite, Chinese has become the language of choice, as investments and tourism keep growing, allowing China to become the backseat driver at the meetings, Takeda concludes. 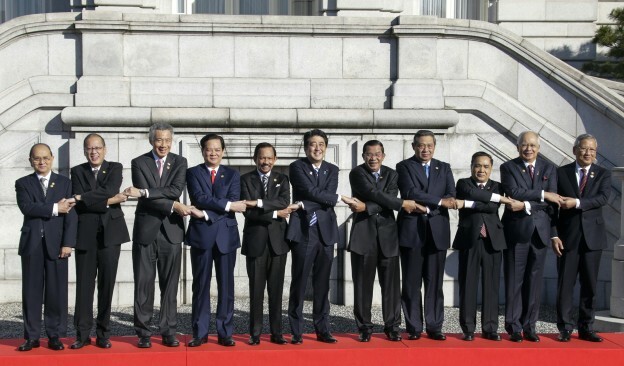 This puts the ASEAN Way in jeopardy with warmth toward and willingness to defy China, dividing the ten. The article focuses on the United States as the target of states willing to defy China, leaving the impression that Japan is a bystander despite its obvious sympathy for these same states and its deep concern for the fate of ASEAN. Only months later, Abe would take office, determined to insert Japan squarely into volatile this mix. In the 2014 edition of his book on ASEAN and regional order, Amitav Acharya warns that ASEAN may lose its bearings, China may opt for a “divide and rule” approach to it, and ASEAN must overcome perceptions it is not able to sustain its centrality.18 To Japan, China has already made that decision. It is intent to seize control of the South China Sea, caring little about the animosity it arouses in littoral states and counting on its economic clout to pressure other states to prioritize ties to China over ASEAN solidarity. It is doubtful that Japan, through all of its courting of the ten states in the organization, expects to overcome this Chinese strategy. Yet, by championing ASEAN as a cohesive entity, joining hands with the United States in resisting China’s “vertical” designs on Southeast Asia and its drive for military predominance there, and raising its own profile as a great power entitled to a special role in Southeast Asia, Japan has switched under Abe to “proactive” diplomacy in this region and with Australia and India as bookends to it. Whereas there was once talk of Japan competing with China in South Korea and Russia, it has joined the fray only in this enlarged Southeast Asia. To build on the momentum of two years of engaging Southeast Asia successfully, Japan would benefit from domestic agreement on collective self-defense and outside agreement on TPP. It needs to solidify both its economic presence and its capacity to support the US military presence in the region. Yet, Japan’s prospects also depend on its ability to balance at least three distinct objectives that influence its thinking. First, are realists in charge, who will be guided by geopolitical calculations, aware that we have entered an era of bipolarity—in Southeast Asia especially—, in which Japan lacks the military and political clout to aspire to more than to reinforce the US strategy? So far, Japanese media exaggerate Japan’s independent regional diplomacy and are reluctant to acknowledge the dominant US role, as well as the ramifications from other global crises for US leadership in this region. Second, are the multilateral aspects of great power and middle power coordination in Southeast Asia adequately understood in Japan, given the presence of India, Australia, and South Korea in the mix of states important for security cooperation and economic assistance? There is too little attention to the linkages between bilateral relations and multilateralism. Finally, do revisionists recognize that Abe’s quest for India to affirm understanding for Japan’s role in liberating Asian states through its military advances in the 1940s and his frequent testing of the limits of reversing the verdicts on history threated to alienate critical Southeast Asian states, to undermine the stress on shared values, and to complicate US leadership, multilateralism, and a clear, realist approach? 1. Tanaka Akihiko, Nitchu kankei 1945-1990 (Tokyo: Tokyo daigaku shuppankai, 1991). 2. Gilbert Rozman, Northeast Asia’s Stunted Regionalism: Bilateral Distrust in the Shadow of Globalization (Cambridge: Cambridge University Press, 2004). 3. Gilbert Rozman, “China’s Quest for Great Power Identity,” Orbis 43, no. 3 (Summer 1999): 383-402; Gilbert Rozman, “China’s Changing Images of Japan 1989-2001: The Struggle to Balance Partnership and Rivalry,” International Relations of the Asia-Pacific, 2, no. 1 (Winter 2002): 95-129. 4. Gilbert Rozman, “Chiikishugi e no tosen: Chugoku to Nihon no akarasamana chokusetsuteki taiko kankei,” (A Challenge for Regionalism: Open, Direct Rivalry of China and Japan) in Aichi daigaku kokusai mondai kenkyujo ed., 21 seiki niokeru Hokutoajia no kokusai mondai (International Relations of Northeast Asia in the 21st Century) (Tokyo: Toho shoten, 2006), 19-46; Gilbert Rozman, “New Challenges in the Regional Integration of China and Japan in 2005,” in Satow Toyoshi and Li Enmin,eds., The Possibility of an East Asian Community: Rethinking the Sino-Japanese Relationship (Tokyo: Ochanomizu shobo, 2006), 389-410; Gilbert Rozman, “Japanese Strategic Thinking on Regionalism,” in Gilbert Rozman, Kazuhiko Togo, and Joseph P. Ferguson, eds., Japanese Strategic Thought toward Asia, (New York: Palgrave, 2007), 243-268. 6. Gilbert Rozman, Northeast Asia’s Stunted Regionalism: Bilateral Distrust in the Shadow of Globalization (Cambridge University Press, 2004); Gilbert Rozman, Togo Kazuhiko, and Joseph P. Ferguson, eds., Japanese Strategic Thought toward Asia (New York: Palgrave, 2007). 7. Gilbert Rozman, “Narrowing the Values Gap in Sino-Japanese Relations: Lessons from 2006-2008,” in Gerrit Gong and Victor Teo, eds., Reconceptualizing the Divide: Identity, Memory, and Nationalism in Sino-Japanese Relations (Cambridge: Cambridge Scholars Publishing, 2010), 25-51. 8. Amako Satoshi, “Nitchu gaiko hikaku kara mita Nitchu kankei: seijoka 30nengo o chushin ni,” in Mori Kazuko and Zhang Yunling, eds., Nitchu kankei o do kochikusuru ka? Ajia no kosei to kyoryoku mezashite (Tokyo: Iwanami shoten, 2004), 25-52. 9. Zhang Yunling, “Keizai no gurobaruka no motarasu chansu to chosen,” in Mori Kazuko and Zhang Yunling, eds., Nitchu kankei o do kochikusuru ka? 177-190. 10. Yu Xintian, “Higashi Ajia aidentiti no taido,” in Mori Kazuko and Zhang Yunling, eds., Nitchu kankei o do kochikusuru ka? 85-111. 11. Yomiuri shimbun, June 2, 2014, 2. 12. Sankei shimbun, June 2, 2014, 1. 13. Terada Takashi, “Nichigo anzen hosho partnership no shinten,” in Yachi Shotaro, ed., Nihon no gaiko to sogoteki anzenhosho (Tokyo: Wedge, 2011), 199-241. 14. Yomiuri shimbun, June 13, 2014, 3. 15. Asahi shimbun, July 8, 2014. 16. Takeda Isami, “Kyodaika suru Chugoku to ASEAN bunretsu no kiki,” Sekai, no. 10 (2012): 158-64. 17. Oba Mie, “Nichi-ASEAN 40 junen no kadai ‘’taito no kyorokusha’ no kankei kochiku ni mukete,” Gaiko (November 2013): 108-114. 18. Amitav Acharya, Constructing a Security Community in Southeast Asia: ASEAN and the Problem of Regional Order (Oxon: Routledge, 2014), 261-267.